I was in Aspen earlier this week working on some of the challenges facing healthcare and the health industry in the US, but it’s time to switch gears. 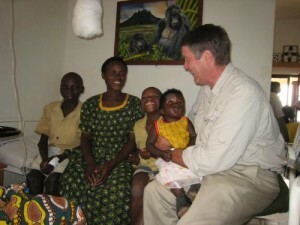 From my 2008 visit to Rwanda with the ONE Campaign. Sunday, I leave for Rwanda to lead a one week group trip with my friend Dr. Paul Farmer to see some of the work being done by Partners in Health (PIH) in the country. I haven’t been in country since 2008, and I’m anxious to see the progress PIH and other groups are making in health. Since the spring of 2005, Paul’s PIH organization has been in Rwanda working closely with the government and the Ministry of Health to reach the rural, underserved areas of the country. PIH began by focusing on HIV/AIDS work, but has now expanded to full healthcare offerings. Today, over 800,000 people are served by PIH’s 40 health facilities. But the health challenges in Rwanda are still vast! Next week with PIH we’ll be considering many aspects of health in Rwanda, but one in particular that I’ll be looking at while I’m there is nutrition. I firmly believe–and have seen firsthand!–that global health diplomacy works as a real and powerful currency of peace worldwide. And a healthy start to life–a mother enjoying a safe and healthy pregnancy leading to a safe birth and healthy infancy–is crucial to building a foundation that leads to stable communities and global peace. Food insecurity and malnutrition account for more than half of the deaths of children under 5 in developing countries, and Rwanda has had its fare share of nutrition challenges. In 2005, 18% of children in the country were underweight. But Rwanda’s government has made real progress in child nutrition since 2009. That year, a Presidential Initiative launched to address malnutrition. The country also joined forces with the US in the Feed the Future initiative. A 2010 health survey showed that chronic malnutrition and stunting affect 44% of children under the age of 5 in Rwanda. In September of last year, the Right Honorable Prime Minister, Dr. Pierre Damien Habumuremyi launched a 1,000 Days Campaign, focusing on food availability and a balanced diet for pregnant women through the first two years of life of their babies. The first 1,000 days may seem like such a small window of opportunity for global change, but the data are clear that childhood undernutrition has long-lasting consequences. WHO models estimate that over half of adults in the prime working age group–20-29 year olds in Rwanda–have been affected by childhood stunting. Many of these adults wear the visible badges of malnutrition: shorter height or lessened muscular development. And for just as many, malnutrition has exacted a mental toll as well, diminishing the cognitive function of the working age population. Along with the rest of what we’ll see–including a bit of gorilla trekking and possibly gorilla surgery–I’m anxious to see what progress Rwanda’s 1,000 Days Campaign has made, and the returns realized on nutrition investment. This entry was posted in Blog, Global Health, Hope Through Healing Hands, Malnutrition, News - Global Health, Notes from the Road. Bookmark the permalink.